SCR4 N-180 Titan Tankless Water Heater Discounts Apply ! 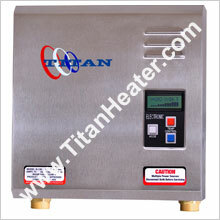 The Titan tankless water heater SCR4 N-180 is one of the latest additions to our product offering. Boasting 18kW of heating power, it will meet the needs of most home owners. Notes: Ratings above using standard 240 Volts. Higher voltage will increase power, just as lower voltage will have the reverse effect. Units available in 208, 277 Volts.Unless otherwise specified, you will receive a 240V unit, as it can be used with 240/220V and it is the most common voltage used for this type of appliance. When installing, check specifications on unit used. Voltage, amperage, breaker and wire size may vary depending on local electrical standards. Consult your local professional for guidance.